Some of the newer themes being developed are really nice and flexible. I came across a few lately that I really liked. When I get a minute perhaps I’ll feature a few others that I have liked. 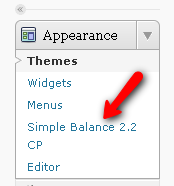 This past week when doing a Blogger to WordPress move (the migration included moving about seven hundred images to the BlueHost WordPress server from Picasa/Blogger), I found one that I really liked called Simple Balance. What is nice about this particular theme is that you can put several different looks on it, change a lot of the features such as show one featured post with the rest excerpted, etc. The site advertises version 2.1, but in fact the download I took was version 2.2. While I appreciate a theme like Thesis with all the hooks and flexibility, using something like this is much more intuitive and offers a lot of simple flexibility. This entry was posted in Blogger to WordPress, Free WP Themes. Bookmark the permalink. ← Why are HubSpot Users Migrating to WordPress?